At the MOU signing between NYP and JA Singapore: (from left) senior manager of FedEx, Derrick Teng; SBM senior lecturer, Alan Fong; SBM deputy director Esther Ho; SBM director Loh Chuu Yi; chairman of JA Dr Patrick Liew; executive director of JA, Ng Hau Yee; and SBM senior lecturer Tan Teck Chuan. 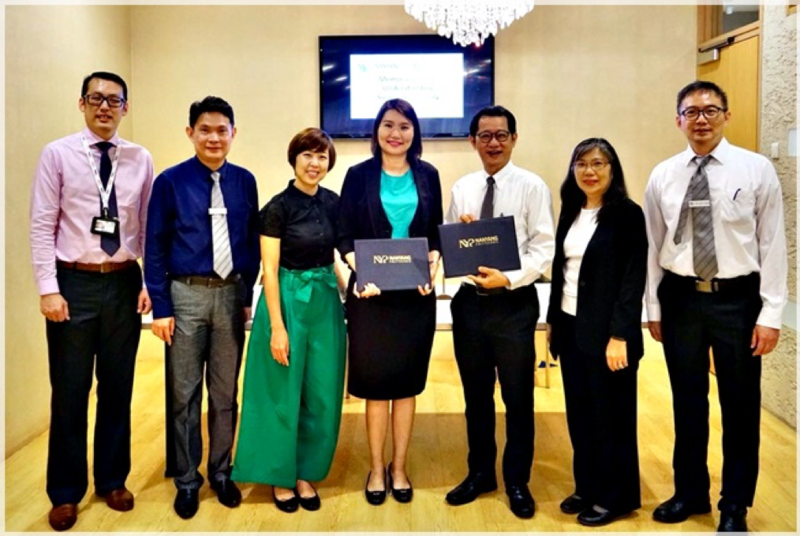 ​SBM students can now enjoy a variety of free customised courses thanks to a new MOU with Junior Achievement (JA) Singapore. JA Worldwide is one of the world's largest non-profit organisation dedicated to inspiring and preparing young people to succeed in a global economy. The customised courses from JA aim to help our students to be future ready for their careers. Through the JA Career JumpStart program - which includes topics on Career Success, Personal Finance, Interview Skills, Job Shadow and Be Entrepreneurial - our students may make a smooth transition into the workforce. The MOU also affirms the good working relationship that has been developed over the years.